COOK: I Just Want Your Creamy Thighs | CookDrinkFeast! I was in the mood for something saucy and cheesy and comforting so I came up with this dish. 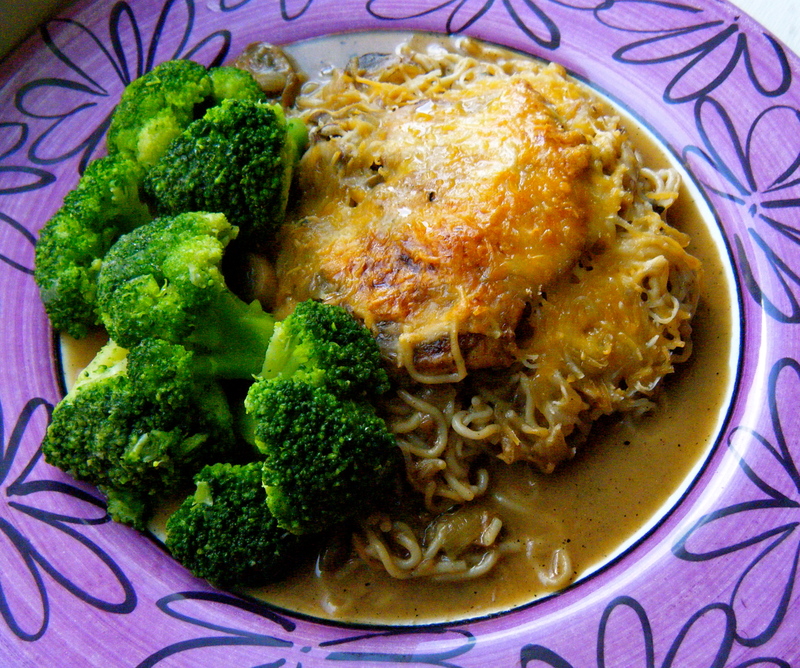 It’s kind of like a beef stroganoff, but with chicken-and cheese. The Greek yogurt gives the sauce some body and a tangy kick. A dash of soy sauce gives the dish some umami – a pleasant savory taste. Season chicken thighs on both sides. Place a large skillet over medium high heat. Spray with non-stick cooking spray. When the skillet is hot, sear chicken thighs on each side, about 5 minutes. Remove chicken thighs from skillet and place them on a plate. Return skillet to heat and add 1 tablespoon olive oil. Once the olive oil is hot, add onions and mushrooms and sauté until onions are translucent. Add chicken stock and stir, scraping up any bits on the bottom of the skillet. Return the chicken thighs to the pan. Pour any juices that have collected on the plate into the pan as well. Add a dash of soy sauce and stir. Bring mixture to a boil and turn heat down to medium-low. Cover and simmer until the chicken is cooked through – about 15 to 20 minutes. Remove chicken from the skillet and add Greek yogurt and pasta, stir. Return chicken to skillet and simmer uncovered until sauce is thickened. Salt and pepper to taste. Sprinkle shredded cheese on top and place skillet in preheated oven. Bake until cheese is melted – about 10 minutes. Serve. Substitute 2 bags tofu shirataki noodles for pasta – Rinse them really well. Then saute them with a little non-stick cooking spray to dry them out a little before adding the noodles. This looks good. But you’ve got both 2 c. cooked pasta and 1 c. cooked penne in the ingredient list. Is that correct? Good catch Jon! I meant 2 cups cooked pasta. Thank you!